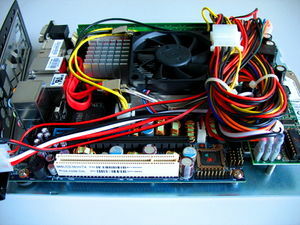 This page describes how to use coreboot on the Kontron 986LCD-M/mITX mainboard. It is maintained by Uwe Hermann. The mainboard's manual (PDF) is available from the vendor website (together with various other documents). 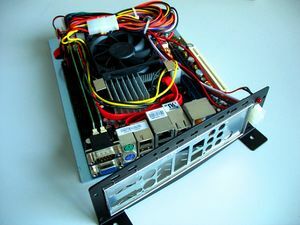 A sample boot log from this board is available in the mailing list archive. Multi-core support OK Both cores show up in /proc/cpuinfo. Hardware virtualization Untested Hardware virtualization is not supported by this CPU (modprobe kvm-intel fails on coreboot + vendor BIOS). DDR2 OK Works fine, but currently you need to populate both RAM slots with DIMMs of the same size (and reasonably similar timing probably: The controller has to operate in Dual Channel mode for now). Dual channel support OK Works fine according to memtest86+ (Tested: 2x 1GB DIMMs, interleaved mode). On-board SATA OK Tested: SATA disk ((hd0,0) / hda1 in FILO, /dev/sda1 in Linux). On-board USB OK Tested: USB thumb drive in all 4 backpanel USB ports, as well as on the USB pin headers on the board (USB6_7, see manual). On-board VGA OK You need to prepend the VGA blob from the proprietary BIOS for this to work. Console works, X11 works (use the intel X.org driver). On-board Ethernet OK All three NICs show up correctly in ifconfig -a and work fine. On-board Audio OK Works fine. On-board FireWire OK Seems to work fine (backpanel FireWire port), even with pci=noacpi. 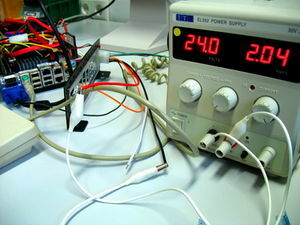 Tested using the eth1394 module for IPv4-over-FireWire. The FireWire pinheader IEEE1394_1 (see manual) is not yet well-tested. On-board CompactFlash OK There's an onboard CompactFlash slot on the back-side of the board. FILO sees it as (hd2,0) / hdc1, Linux as /dev/sdb1. PCI add-on cards OK Works fine, tested with a PCI network card. Serial port 2 (COM2) Untested There are also COM3 and COM4 pin headers on this board. Parallel port OK Doing modprobe ppdev works, but no further test were performed. You probably need a special cable to connect to the onboard pin-header. Sensors / fan control OK Works fine using the w83627hf, coretemp (and also i2c-dev, i2c-i810, and eeprom) Linux kernel modules. Hardware watchdog OK Not yet actually tested, but it seems to be found: iTCO_wdt: Found a ICH7 or ICH7R TCO device (Version=2, TCOBASE=0x0560). CPU frequency scaling WIP With pci=noacpi the cpufreq-info utility doesn't output anything useful. On vendor BIOS you can use p4-clockmod (discouraged) or acpi-cpufreq (iff you enabled the respective option in the BIOS menu). On coreboot with ACPI, you can modprobe p4-clockmod successfully (but not acpi-cpufreq), but it's unclear if it really works correctly. Reboot OK Seems to work fine, even with pci=noacpi. High precision event timers (HPET) OK The HPET is detected by Linux (hpet0: at MMIO 0xfed00000, IRQs 2, 8, 0) and powertop output suggests that it works ok.
Wake on LAN OK Works fine. Tested using the wakeonlan utility. Wake on keyboard Untested Works fine with vendor BIOS. Wake on mouse N/A Doesn't seem to be supported (by the hardware / vendor BIOS), tested with a PS/2 mouse, as well as with a USB mouse. Flashrom OK Works fine, but you might need -m kontron:986lcd-m when booted with the vendor BIOS (not needed when booted with coreboot). The resulting build/coreboot.rom is your coreboot ROM image you can flash using flashrom. 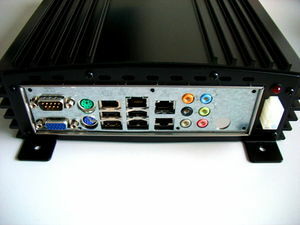 If you use FILO, SATA will probably be hda and hdb, while hdc is the master drive of the IDE controller. If you experience kernel crashes (when building without onboard VGA support) try to blacklist the agpgart and intel_agp kernel modules. This is a non-scientific, quick'n'dirty boot speed measurement using coreboot v2 (r4341) + FILO trunk (r98) and the vendor BIOS, where coreboot was configured with no serial output (loglevel 0). Although coreboot is ca. 6 seconds faster at the GRUB prompt, the "Loading initrd" part of the Linux kernel booting seems to take longer than on the vendor BIOS. This should be investigated.